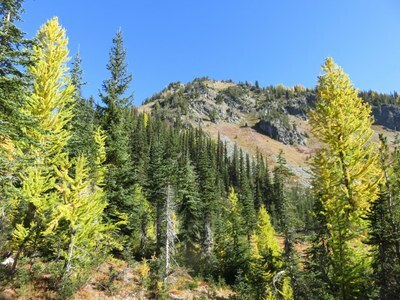 Wonderful area to see larch trees, although we were about one week early. Some of the trees were only starting to turn, one week later will be better. The road is still deeply rutted from earlier rains and snow melt with some big rocks exposed. There was ample parking mid-week, but I can imagine it getting full on the weekends. 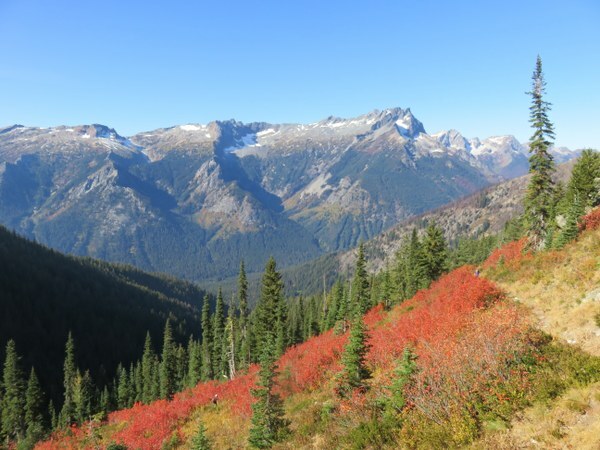 Although we saw few people on Carne Mountain, the Phelps Creek Trail to Spider Meadows can be very busy. We had nearly perfect weather. It was a little smoky but we had good visibility on the top and could easily make out Mount Rainier, Mount Stuart and all the closer mountains. The larches had started to turn but we were about one week before their peak.